The British Trombone Society in conjunction with the S.E.L.B. Music Service have announced that it will be holding a National Trombone Day - N.I. on Sunday 30th March 2014 in Bann House, Bridge Street, Portadown, BT63 5AE and will run from 11:00 until 16:00. 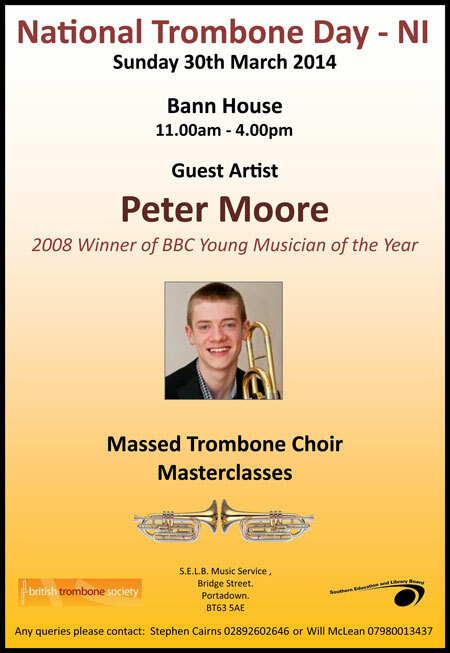 The guest artist will be Peter Moore - winner of the BBC Young Musician of the Year 2008. Peter will be performing solos, and taking master classes. The highlight of the day has to be every participant joining together to form the MASSED TROMBONE CHOIR. This event is open to trombonists of any age, any standard (above grade 2), senior and junior band members. Please bring your instruments. There will be parts in treble and bass clefs available and it is sure to be a day of fun and playing for all trombonists.